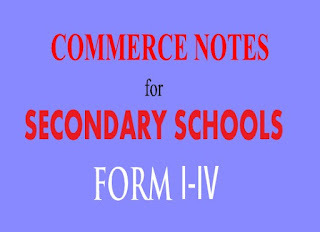 Home / COMMERCE / COMMERCE FORM FOUR STUDY NOTES, TOPIC 3-4. 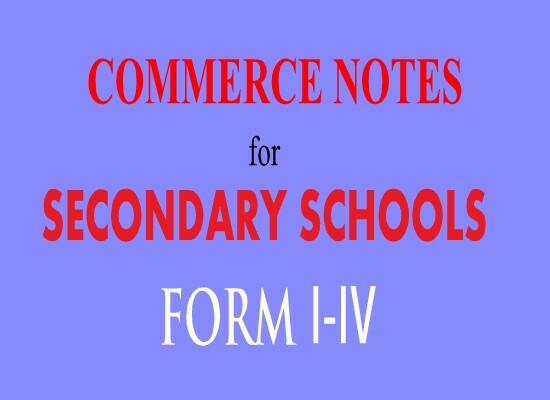 COMMERCE FORM FOUR STUDY NOTES, TOPIC 3-4. A business organisation is one unit of control which is engaged in the production or distribution of any commodity.business organisation are of business nature from the point of view of ownership,control and size. Asoleproprietorship, also known as thesole traderor simply a proprietorship, is a type of business entity that is owned and run by one natural person and in which there is no legal distinction between the owner and the business. A partnership is an arrangement in which two or more individuals share theprofitsandliabilitiesof a business venture. Various arrangements are possible: all partners might share liabilities and profits equally, or some partners may havelimited liability. Not every partner is necessarily involved in the management and day-to-day operations of the venture. In some jurisdictions, partnerships enjoy favorable tax treatment relative tocorporations. A joint stock company is an organization that falls between the definitions of a partnership and corporation in terms ofshareholderliability. In the United States, shareholders of joint stock companies haveunlimited liabilityfor company debts, but in the United Kingdom, shareholder liability is limited to thenominal valueof shares held by each shareholder. The shares of a joint stock company are transferable, so for a public joint stock company, the shares may be traded on a registered exchange, but for a private joint stock company, they are transferable between private parties. Astate-owned enterprise (SOE), also calledstate-owned company,state-owned entity,state enterprise,publicly owned corporation,government business enterprise,crown corporation,government-owned corporation,commercial government agency,public sector undertaking, orparastatal, is a legal entity that undertakescommercialactivities on behalf of an owner, thegovernment. The legal status of SOEs varies from being a part of the government to beingstock companieswith the state as a regularstockholder. The defining characteristics of SOEs are that they have a distinct legal form and are established to operate in commercial affairs. While they may also have public policy objectives, SOEs should be differentiated from other forms of government agencies or state entities established to pursue purely nonfinancial objectives. Government-owned corporations are common withnatural monopoliesand infrastructure, such as railways and telecommunications, strategic goods and services (mail, weapons), natural resources and energy, politically sensitive business, broadcasting, demerit goods (alcohol), and merit goods (healthcare). Sole proprietorship is the simplest and easiest to form. It does not require legal recognition and attendant formalities. This form is the most popular form in India due to the distinct advantages it offers. William R. Basset opines that “The one-man control is the best in the world if that man is big enough to manage everything”. One Man Ownership: In proprietorship, only one man is the owner of the enterprise. No Separate Business Entity: No distinction is made between the business concern and the proprietor. Both are one and the same. No Separation between Ownership and Management: In proprietorship, management rests with the proprietor himself/herself. The proprietor is a manager also. Unlimited Liability: Unlimited liability means that in case the enterprise incurs losses, the private property of the proprietor can also be utilized for meeting the business obligations to outside parties. All Profits or Losses to the Proprietor: Being the sole owner of the enterprise, the proprietor enjoys all the profits earned and bears the full brunt of all losses incurred by the enterprise. Less Formalities: A proprietorship business can be started without completing much legal formalities. There are some businesses that too can be started simply after obtaining necessary manufacturing licence and permits. PARNERSHIP is a relationship between persons carrying on a business in common with a view of profit.The persons who own the partnership business are individually called ‘partners’ and collectively they are called as ‘firm’ or ‘partnership firm’. The name under which partnership business is carried on is called ‘Firm Name’. In a way, the firm is nothing but an abbreviation for partners. More Persons: As against proprietorship, there should be at least two persons subject to a maximum of ten persons for banking business and twenty for non-banking business to form a partnership firm. Utmost Good Faith and Honesty: A partnership business solely rests on utmost good faith and trust among the partners. Unlimited Liability: Like proprietorship, each partner has unlimited liability in the firm. This means that if the assets of the partnership firm fall short to meet the firm’s obligations, the partners’ private assets will also be used for the purpose. Principal-Agent Relationship: The partnership firm may be carried on by all partners or any of them acting for all. While dealing with firm’s transactions, each partner is entitled to represent the firm and other partners. In this way, a partner is an agent of the firm and of the other partners. Simple Form of Organisation: Proprietorship is the simplest form of organisation. The entrepreneur can start his/her enterprise after obtaining license and permits. There is no need to go through the legal formalities. For starting a small enterprise, no formal registration is statutorily needed. Owner’s Freedom to Take Decisions: The owner, i.e. the proprietor is free to make all decisions and reap all the fruits of his labour. There is no other person who can interfere or weigh him down. High Secrecy: Secrecy is another major advantage offered by proprietorship. This is because the whole business is handled by the proprietor himself and, as such, the business secrets are known to him only. Added to it, the proprietor is not bound to reveal or publish his accounts. In present day business atmosphere, the less a competitor knows about one’s business, better off one is. What the competitors can make is guesstimates only. Tax Advantage: As compared to other forms of ownership, the proprietorship form of ownership enjoys certain tax advantages. For example, a proprietor’s income is taxed only once while corporate income is, at occasions taxed twice, say, double taxation. Easy Dissolution: In proprietorship business, the entrepreneur is all in all. As there are no co-owners or partners, therefore, there is no scope for the difference of opinion in the case the proprietor/entrepreneur-wants to dissolve the business. It is due to the easy formation and dissolution, proprietorship is often used to test the business ideas. Pro prietorship form of ownership suffers from some disadvantages also. Limited Resources: A proprietor has limited resources at his/her command. The proprietor mainly relies on his/her funds and savings and, to a limited extent, borrowings from relatives and friends. Thus, the scope for raising funds is highly limited in proprietorship. This, in turn’ deters the expansion and development of an enterprise. Limited Ability: Proprietorship is characterised as one-man show. One man may be expert in one or two areas, but not in all areas like production, finance, marketing, personnel, etc. Then, due to the lack of adequate and relevant knowledge, the decisions taken by him be imbalanced. Unlimited Liability: Proprietorship is characterised by unlimited liability also. It means that in case of loss, the private property of the proprietor will also be used to clear the business obligations. Hence, the proprietor avoid taking risk. Easy Formation: Partnership is a contractual agreement between the partners to run an enterprise. Hence, it is relatively ease to form. Legal formalities associated with formation are minimal. Though, the registration of a partnership is desirable, but not obligatory. More Capital Available: We have just seen that sole proprietorship suffers from the limitation of limited funds. Partnership overcomes this problem, to a great extent, because now there are more than one person who provide funds to the enterprise. It also increases the borrowing capacity of the firm. Moreover, the lending institutions also perceive less risk in granting credit to a partnership than to a proprietorship because the risk of loss is spread over a number of partners rather than only one. . Combined Talent, Judgement and Skill: As there are more than one owners in partnership, all the partners are involved in decision making. Usually, partners are pooled from different specialised areas to complement each other. For example, if there are three partners, one partner might be a specialist in production, another in finance and the third in marketing. This gives the firm an advantage of collective expertise for taking better decisions. Thus, the old maxim of “two heads being better than one” aptly applies to partnership. Diffusion of Risk: You have just seen that the entire losses are borne by the sole proprietor only but in case of partnership, the losses of the firm are shared by all the partners as per their agreed profit-sharing ratios. Thus, the share of loss in case of each partner will be less than that in case of proprietorship. Flexibility: Like proprietorship, the partnership business is also flexible. The partners can easily appreciate and quickly react to the changing conditions. No giant business organisation can stifle so quick and creative responses to new opportunities. Tax Advantage: Taxation rates applicable to partnership are lower than proprietorship and company forms of business ownership. In spite of above advantages, there are certain drawbacks also associated with the partnership form of business organisation. Unlimited Liability: In partnership firm, the liability of partners is unlimited. Just as in proprietorship, the partners’ personal assets may be at risk if the business cannot pay its debts. Divided Authority: Sometimes the earlier stated maxim of two heads better than one may turn into “too many cooks spoil the broth.” Each partner can discharge his responsibilities in his concerned individual area. But, in case of areas like policy formulation for the whole enterprise, there are chances for conflicts between the partners. Disagreements between the partners over enterprise matters have destroyed many a partnership. Lack of Continuity: Death or withdrawal of one partner causes the partnership to come to an end. So, there remains uncertainty in continuity of partnership. Risk of Implied Authority: Each partner is an agent for the partnership business. Hence, the decisions made by him bind all the partners. At times, an incompetent partner may lend the firm into difficulties by taking wrong decisions. Risk involved in decisions taken by one partner is to be borne by other partners also. Choosing a business partner is, therefore, much like choosing a marriage mate life partner. Management – act of allocating resources to accomplish desired goals and objectives efficiently and effectively. Management comprises planning, organizing, staffing, leading or directing, and controlling an organization (a group of one or more people or entities) or effort for the purpose of accomplishing a goal.or is the organization and coordination of the activities of a business in order to achieve defined objectives. Or isThe activities associated with running a company, such as controlling, leading, monitoring, organizing, and planning. Management principles are guidelines for the decisions and actions of managers. Division of Work - According to this principle the whole work is divided into small tasks.The specialization of the workforce according to the skills of a person , creating specific personal and professional development within the labour force and therefore increasing productivity; leads to specialization which increases the efficiency of labour. Authority and Responsibility - This is the issue of commands followed by responsibility for their consequences. Authority means the right of a superior to give enhance order to his subordinates; responsibility means obligation for performance. Discipline - It is obedience, proper conduct in relation to others, respect of authority, etc. It is essential for the smooth functioning of all organizations. Unity of Command - This principle states that each subordinate should receive orders and be accountable to one and only one superior. If an employee receives orders from more than one superior, it is likely to create confusion and conflict. Unity of Direction - All related activities should be put under one group, there should be one plan of action for them, and they should be under the control of one manager. Subordination of Individual Interest to Mutual Interest - The management must put aside personal considerations and put company objectives firstly. Therefore the interests of goals of the organization must prevail over the personal interests of individuals. Remuneration - Workers must be paid sufficiently as this is a chief motivation of employees and therefore greatly influences productivity. The quantum and methods of remuneration payable should be fair, reasonable and rewarding of effort. The Degree of Centralization - The amount of power wielded with the central management depends on company size. Centralization implies the concentration of decision making authority at the top management. Line of Authority/Scalar Chain - This refers to the chain of superiors ranging from top management to the lowest rank. The principle suggests that there should be a clear line of authority from top to bottom linking all managers at all levels. Order - Social order ensures the fluid operation of a company through authoritative procedure. Material order ensures safety and efficiency in the workplace. Order should be acceptable and under the rules of the company. Equity - Employees must be treated kindly, and justice must be enacted to ensure a just workplace. Managers should be fair and impartial when dealing with employees, giving equal attention towards all employees. Stability of Tenure of Personnel - Stability of tenure of personnel is a principle stating that in order for an organization to run smoothly, personnel (especially managerial personnel) must not frequently enter and exit the organization. Initiative - Using the initiative of employees can add strength and new ideas to an organization. Initiative on the part of employees is a source of strength for organization because it provides new and better ideas. Employees are likely to take greater interest in the functioning of the organization. Esprit de Corps - This refers to the need of managers to ensure and develop morale in the workplace; individually and communally. Team spirit helps develop an atmosphere of mutual trust and understanding. Team spirit helps to finish the task on time. They make plans for the subunits of the organization. They supervise & guide the subordinates. IMPORTANCE OF MANAGEMENT IN BUSINESS ORGANISATION. It helps in Achieving Group Goals - It arranges the factors of production, assembles and organizes the resources, integrates the resources in effective manner to achieve goals. It directs group efforts towards achievement of predetermined goals. By defining objective of organization clearly there would be no wastage of time, money and effort. Management converts disorganized resources of men, machines, money etc. into useful enterprise. These resources are coordinated, directed and controlled in such a manner that enterprise work towards attainment of goals. Optimum Utilization of Resources - Management utilizes all the physical & human resources productively. This leads to efficacy in management. Management provides maximum utilization of scarce resources by selecting its best possible alternate use in industry from out of various uses. It makes use of experts, professional and these services leads to use of their skills, knowledge, and proper utilization and avoids wastage. If employees and machines are producing its maximum there is no under employment of any resources. Reduces Costs - It gets maximum results through minimum input by proper planning and by using minimum input & getting maximum output. Management uses physical, human and financial resources in such a manner which results in best combination. This helps in cost reduction. Establishes Sound Organization - No overlapping of efforts (smooth and coordinated functions). To establish sound organizational structure is one of the objective of management which is in tune with objective of organization and for fulfillment of this, it establishes effective authority & responsibility relationship i.e. who is accountable to whom, who can give instructions to whom, who are superiors & who are subordinates. Management fills up various positions with right persons, having right skills, training and qualification. All jobs should be cleared to everyone. Establishes Equilibrium - It enables the organization to survive in changing environment. It keeps in touch with the changing environment. With the change is external environment, the initial co-ordination of organization must be changed. So it adapts organization to changing demand of market / changing needs of societies. It is responsible for growth and survival of organization. Essentials for Prosperity of Society - Efficient management leads to better economical production which helps in turn to increase the welfare of people. Good management makes a difficult task easier by avoiding wastage of scarce resource. It improves standard of living. It increases the profit which is beneficial to business and society will get maximum output at minimum cost by creating employment opportunities which generate income in hands. Organization comes with new products and researches beneficial for society. The planning function of management controls all the planning that allows the organization to run smoothly. Planning involves defining a goal and determining the most effective course of action needed to reach that goal. Typically, planning involves flexibility, as the planner must coordinate with all levels of management and leadership in the organization. Planning also involves knowledge of the company’s resources and the future objectives of the business. The organizing function of leadership controls the overall structure of the company. The organizational structure is the foundation of a company; without this structure, the day-to-day operation of the business becomes difficult and unsuccessful. Organizing involves designating tasks and responsibilities to employees with the specific skill sets needed to complete the tasks. Organizing also involves developing the organizational structure and chain of command within the company. The coordinating function of leadership controls all the organizing, planning and staffing activities of the company and ensures all activities function together for the good of the organization. Coordinating typically takes place in meetings and other planning sessions with the department heads of the company to ensure all departments are on the same page in terms of objectives and goals. Coordinating involves communication, supervision and direction by management. The staffing function of management controls all recruitment and personnel needs of the organization. The main purpose of staffing is to hire the right people for the right jobs to achieve the objectives of the organization. Staffing involves more than just recruitment; staffing also encompasses training and development, performance appraisals, promotions and transfers. Without the staffing function, the business would fail because the business would not be properly staffed to meet its goals. The controlling function of management is useful for ensuring all other functions of the organization are in place and are operating successfully. Controlling involves establishing performance standards and monitoring the output of employees to ensure each employee’s performance meets those standards. The controlling process often leads to the identification of situations and problems that need to be addressed by creating new performance standards. 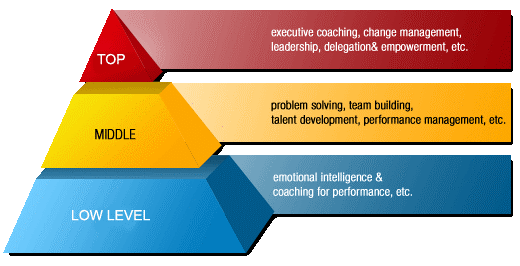 The level of performance affects the success of all aspects of the organization. Types of Organisational Structures: their Advantages and Disadvantages! All managers must bear that there are two organisations they must deal with-one formal and the other informal.The formal organisation in usually delineated by an organisational chart and job descriptions. The official reporting relationships are clearly known to every manager.Alongside the formal organisation exists are informal organisation which is a set of evolving relationships and patterns of human interaction within an organisation that are not officially prescribed. 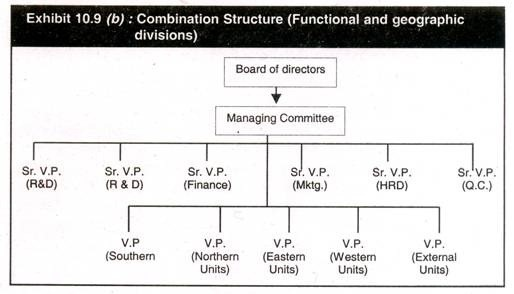 Staff or functional authority organisational structure. 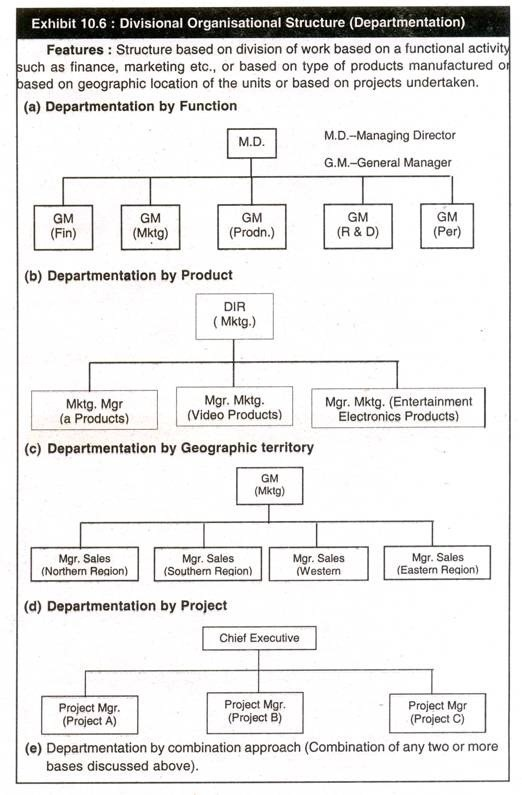 Line and staff organisational structure. A line organisation has only direct, vertical relationships between different levels in the firm. 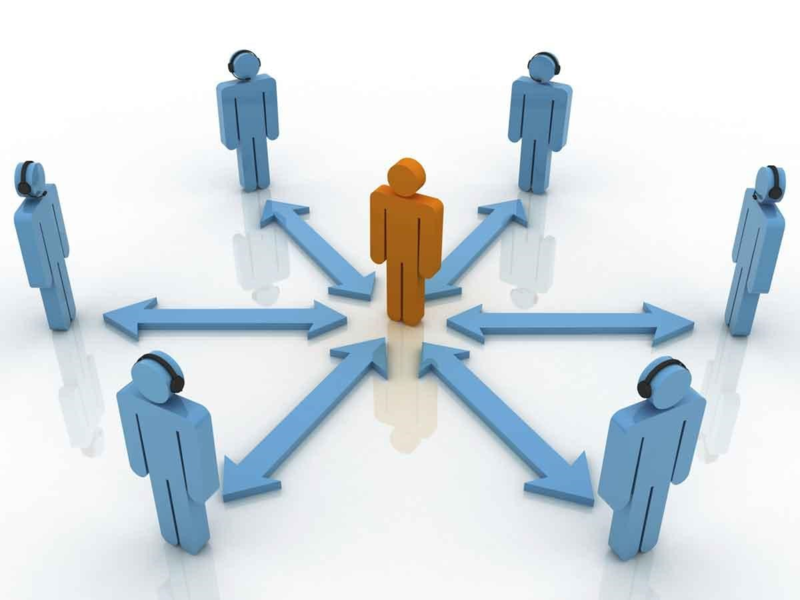 There are only line departments-departments directly involved in accomplishing the primary goal of the organisation. For example, in a typical firm, line departments include production and marketing. In a line organisation authority follows the chain of command. Exhibit 10.3 illustrates a single line organisational structure. Has only direct vertical relationships between different levels in the firm. A line structure tends to simplify and clarify responsibility, authority and accountability relationships. The levels of responsibility and authority are likely to be precise and understandable. A line structure promotes fast decision making and flexibility. Because line organisations are usually small, managements and employees have greater closeness. As the firm grows larger, line organisation becomes more ineffective. Improved speed and flexibility may not offset the lack of specialized knowledge. Managers may have to become experts in too many fields. There is a tendency to become overly dependent on the few key people who an perform numerous jobs. Staff position: A position intended to provide expertise, advice and support for the line positions. The line officers or managers have the direct authority (known as line authority) to be exercised by them to achieve the organisational goals. The staff officers or managers have staff authority (i.e., authority to advice the line) over the line. This is also known as functional authority. An organisation where staff departments have authority over line personnel in narrow areas of specialization is known as functional authority organisation. 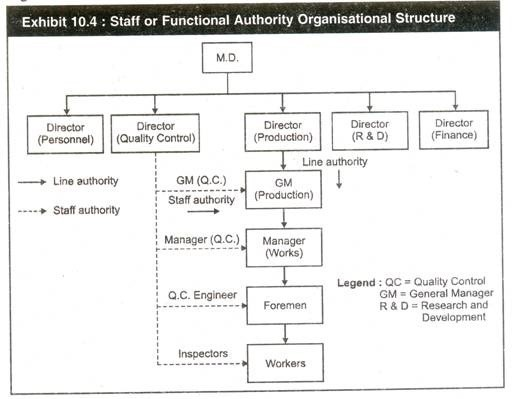 Exhibit 10.4 illustrates a staff or functional authority organisational structure. In the line organisation, the line managers cannot be experts in all the functions they are required to perform. But in the functional authority organisation, staff personnel who are specialists in some fields are given functional authority (The right of staff specialists to issue orders in their own names in designated areas). The principle of unity of command is violated when functional authority exists i.e., a worker or a group of workers may have to receive instructions or orders from the line supervisor as well as the staff specialist which may result in confusion and the conflicting orders from multiple sources may lead to increased ineffectiveness. Some staff specialists may exert direct authority over the line personnel, rather than exert advice authority (for example, quality control inspector may direct the worker as well as advise in matters related to quality). the tendency to keep authority centralized at higher levels in the organisation. Most large organisations belong to this type of organisational structure. These organisations have direct, vertical relationships between different levels and also specialists responsible for advising and assisting line managers. Such organisations have both line and staff departments. Staff departments provide line people with advice and assistance in specialized areas (for example, quality control advising production department). Exhibit 10.5 illustrates the line and staff organisational chart. The line functions are production and marketing whereas the staff functions include personnel, quality control, research and development, finance, accounting etc. The staff authority of functional authority organisational structure is replaced by staff responsibility so that the principle of unity of command is not violated. Some staffs perform only one of these functions but some may perform two or all the three functions. The primary advantage is the use of expertise of staff specialists by the line personnel. The span of control of line managers can be increased because they are relieved of many functions which the staff people perform to assist the line. Even through a line and staff structure allows higher flexibility and specialization it may create conflict between line and staff personnel. Line managers may not like staff personnel telling them what to do and how to do it even though they recognize the specialists’ knowledge and expertise. Some staff people have difficulty adjusting to the role, especially when line managers are reluctant to accept advice. Staff people may resent their lack of authority and this may cause line and staff conflict. Line and staff have direct vertical relationship between different levels. Staff specialists are responsible for advising and assisting line managers/officers in specialized areas. Service: Maintenance, Purchase, Stores, Finance, Marketing. Control: Quality control, Cost control, Auditing etc. Use of expertise of staff specialists. Relieves line authorities of routine and specialized decisions. No need for all round executives. Conflict between line and staff may still arise. Staff officers may resent their lack of authority. Co-ordination between line and staff may become difficult. Committee members can be motivated to participate in group decision making. Group discussion may lead to creative thinking. Committees may delay decisions, consume more time and hence more expensive. Group action may lead to compromise and indecision. 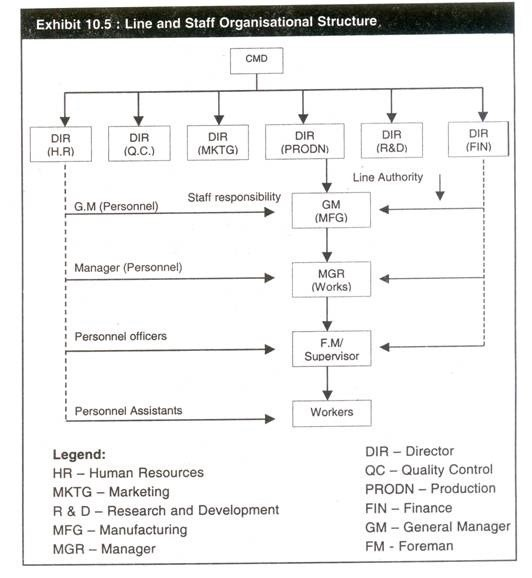 Exhibit 10.6 illustrates organisational structures formed based on the above basis of departmentation. The line, line and staff and functional authority organisational structures facilitate establishment and distribution of authority for vertical coordination and control rather than horizontal relationships. In some projects (complex activity consisting of a number of interdependent and independent activities) work process may flow horizontally, diagonally, upwards and downwards. The direction of work flow depends on the distribution of talents and abilities in the organisation and the need to apply them to the problem that exists. The cope up with such situations, project organisations and matrix organisations have emerged. A project organisation is a temporary organisation designed to achieve specific results by using teams of specialists from different functional areas in the organisation. The project team focuses all its energies, resources and results on the assigned project. Once the project has been completed, the team members from various cross functional departments may go back to their previous positions or may be assigned to a new project. Some of the examples of projects are: research and development projects, product development, construction of a new plant, housing complex, shopping complex, bridge etc. 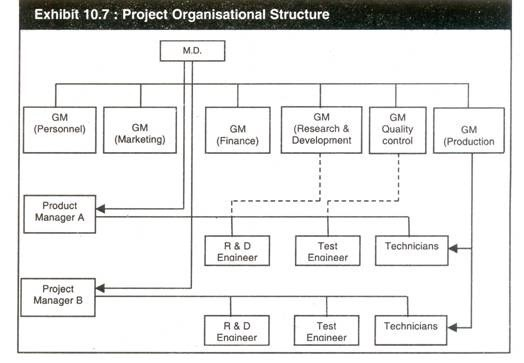 Exhibit 10.7 illustrates a project organisational structure. Temporary organisation designed to achieve specific results by using teams of specialists from different functional areas in the organisation. Work is defined by a specific goal and target date for completion. Work is unique and unfamiliar to the organisation. Work is complex having independent activities and specialized skills are necessary for accomplishment. Work is critical in terms of possible gains or losses. Work is not repetitive in nature. Personnel are assigned to a project from the existing permanent organisation and are under the direction and control of the project manager. The project manager specifies what effort is needed and when work will be performed whereas the concerned department manager executes the work using his resources. The project manager gets the needed support from production, quality control, engineering etc. for completion of the project. The authority over the project team members is shared by project manager and the respective functional managers in the permanent organisation. The services of the specialists (project team members) are temporarily loaned to the project manager till the completion of the project. There may be conflict between the project manager and the departmental manager on the issue of exercising authority over team members. Since authority relationships are overlapping with possibilities of conflicts, informal relationships between project manager and departmental managers (functional managers) become more important than formal prescription of authority. Full and free communication is essential among those working on the project. It is a permanent organisation designed to achieve specific results by using teams of specialists from different functional areas in the organisation. The matrix organisation is illustrated in Exhibit 10.8. Efficient use of support systems. Potential confusion over authority and responsibility. Overemphasis on group decision making. Excessive focus on internal relations. This type of organisation is often used when the firm has to be highly responsive to a rapidly changing external environment. 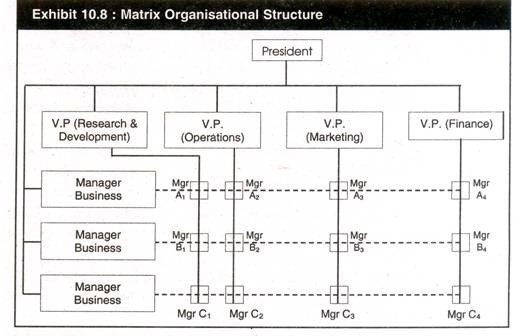 In matrix structures, there are functional managers and product (or project or business group) managers. Functional manager are in charge of specialized resources such as production, quality control, inventories, scheduling and marketing. Product or business group managers are incharge of one or more products and are authorized to prepare product strategies or business group strategies and call on the various functional managers for the necessary resources. The problem with this structure is the negative effects of dual authority similar to that of project organisation. The functional managers may lose some of their authority because product managers are given the budgets to purchase internal resources. In a matrix organisation, the product or business group managers and functional managers have somewhat equal power. There is possibility of conflict and frustration but the opportunity for prompt and efficient accomplishment is quite high. 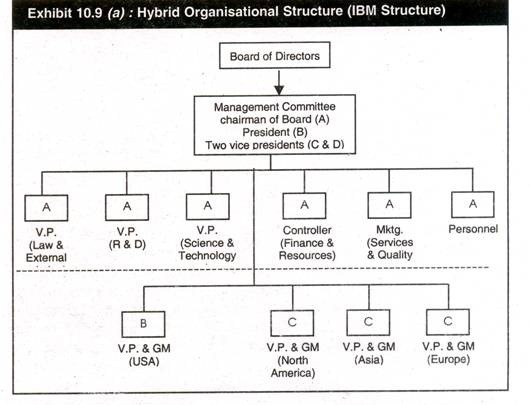 Exhibit 10.9 (a) illustrates the hybrid organisational structure. Alignment of corporate and divisional goals. Adaptability and flexibility in divisions. Conflicts between corporate departments and units. Slow response to exceptional situations. This type of structure is used by multinational companies operating in the global environment, for example, International Business Machines USA. This kind of structure depends on factors such as degree of international orientation and commitment. Multinational corporations may have their corporate offices in the country of origin and their international divisions established in various countries reporting to the CEO or president at the headquarters. The international divisions or foreign subsidiaries may be grouped into regions such as North America, Asia, Europe etc. and again each region may be subdivided into countries within each region. While the focus is on international geographic structures, companies may also choose functional or process or product departmentation in addition to geographic pattern while at the head quarter’s the departmentation may be based on function. It is continuously changing: The informal organisation is dynamic. It involves members from various organisational levels. It is affected by relationship outside the firm. It has a pecking order: certain people are assigned greater importance than others by the informal group. Assists in accomplishing the work faster. Helps to remove weakness in the formal structure. Lengthens the effective span of control. Compensation for violations of formal organisational principles. Provides an additional channel of communication. Provides emotional support for employees. May work against the purpose of formal organisation. Reduces the degree of predictability and control. Reduces the number of practical alternatives. Increases the time required to complete activities. Principle of specialization: Sound and effective organization believes on organization. The term specialization is related to work and employees. When an employee takes special type of knowledge and skill in any area, it is known as specialization. Modern business organization needs the specialization, skill and knowledge by this desired sector of economy and thus, efficiency would be established. Principle of authority: Authority is the kind of right and power through which it guides and directs the actions of others so that the organizational goals can be achieved. It is also related with decision making. It is vested in particular position, not to the person because authority is given by an institution and therefore it is legal. It generally flows from higher level to lowest level of management. There should be unbroken line of authority. Principle of responsibility: Authentic body of an organization is top level management, top level management direct the subordinates. Departmental managers and other personnel take the direction from top level management to perform the task. Authority is necessary to perform the work .only authority is not provided to the people but obligation is also provided. So the obligation to perform the duties and task is known as responsibility. Responsibility can’t be delegated. It can’t be avoided. Principle of efficiency: In enterprise different resources are used. Therese resources must be used in effective manner. When the organization fulfill the objectives with minimum cost, it is effective. Organization must always concentrate on efficiency. Principle of unity of command: subordinates should receive orders from single superior at a time and all subordinates should be accountable to that superior. More superior leads to confusion, delay and so on. Principle of span of control: unlimited subordinates cant be supervised by manager, this principle thus helps to determine numerical limit if subordinates to be supervised by a manager. This improves efficiency. Principle of balance: the functional activities their establishment and other performances should be balanced properly. Authority, centralization, decentralization must be balance equally. This is very challenging job but efficient management must keep it. Principle of simplicity: this principles emphasizes the simplicity of organizational structure, the structure if organization should be simple with minimum number of levels do that its member an understand duties and authorities. Unity of commandprovides that an employee is responsible to only one supervisor, who in turn is responsible to only one supervisor, and so on up the organizational hierarchy. This is true even if the top of the organization is led by a group of people. For example, imagine you are the CEO of a technology firm in Silicon Valley. While the board of directors of your company governs the policy making and strategic planning, under the concept of unity of command, you do not answer to all members of the board, but only the chairman of the board. A duty or obligation to satisfactorily perform or complete a task (assigned by someone, or created by one's own promise or circumstances) that one must fulfill, and which has a consequent penalty for failure. Measures ofEffectiveness(MOE) Measures ofEffectiveness(MOE) aremeasuredesigned to correspond to accomplishment of mission objectives and achievement of desired results. They quantify the results to be obtained by a system and may be expressed as probabilities that the system will perform as required. Terrance is a supervisor at MegaCorp, a large, multinational conglomerate. He works in the product division, overseeing a team that assembles components for computers. Terrance can only effectively manage a certain number of people at one time. On the other hand, if he manages too few, the company will not operate efficiently, and that costs money. The number of employees that can be controlled directly by a manager is called the manager'sspan of control. Span of control depends on such factors as the type of work, the complexity of the work and the variability of the work task. Let's look at some examples. Terrance's team works in a very controlled environment because of the fragility of the electronic components, such as motherboards, video cards and audio cards, that must be installed. Additionally, installation is somewhat complex and time consuming. Terrance's span of control is, therefore, fairly narrow. Let's say that Terrance decides to pull some overtime in the packaging department. Now Terrance is supervising a team that is packing up Ethernet cables that are sold separately as an accessory. The cables are pretty durable and all the team is doing is putting individual display packages into shipping boxes for delivery to the company's retail distributors. Given the relative simplicity of the task, Terrance's span of control can be much broader. In other words, he can manage many more employees at the same time compared to when he is managing his regular team installing computer components. STUDY NOTES FORM THREE TOPIC 6-8. FORM FOUR STUDY NOTES, TOPIC 1-2. FORM FOUR STUDY NOTES, TOPIC 3-4.